"A Room on the Garden Side," a short story originally written by Ernest Hemingway in 1956, has been published for the first time in this summer's issue of Strand Magazine. The story, set in the Ritz Hotel in Paris at the end of WWII, "paints a vivid sketch of soldiers tired from war, yet hopeful for the future." Hemingway scholar Kirk Curnutt contributed an afterward to the story, placing it in a larger context. (Curnutt's afterward is also available online here). Hemingway wrote a handful of similar stories around the same time, which he sent to his publisher Charles Scribner with a note that included the following, "I suppose they are a little shocking since they deal with irregular troops and combat and with people who actually kill people....Anyway you can always publish them after I'm dead." 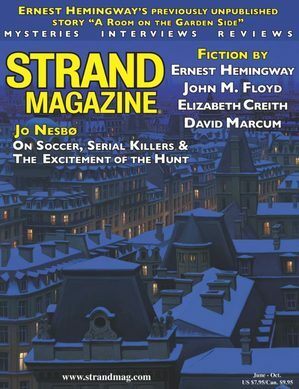 Strand Magazine acquired the rights to publish the story from the Hemingway Estate last October. While Hemingway scholars have known about "A Room on the Garden Side" for decades, Strand's publication marks the first time it is available to a wider audience. Managing editor of the Strand, Andrew Gulli, said, "[The Estate has] steered away from commercializing anything unpublished," in an interview with PBS. "They were very kind to give the story to the Strand because they understand we have a good track record of publishing unpublished works. They want to make sure that if something is released that it will honor the memory of Ernest Hemingway." The Strand is no stranger to releasing previously unpublished or lost material from a variety of 20th-century luminaries. (We've covered their publication of a Faulkner story here and a Fitzgerald story here). Hemingway fans and collectors can order the 55th issue of Strand, inclusive of "A Room on the Garden Side," from the magazine's website.